"Some people move on... but not us." These chilling words, spoken by Captain America, are enough to raise the hairs on your skin and are the axis of this new advance for 'Avengers: Endgame'. The 30-second trailer was released by Marvel during the Super Bowl, the head to head showdown between the New England Patriots and the LA Rams in the USA's annual biggest sports game. As if it were a spin-off of 'The Leftovers', the clip shows how the world has tried to move past the devastating events caused by Thanos' click, with some trying to understand it and others choosing simply to forget. But the Avengers are not so easily quelled; they seek revenge. Steve Rogers and the other survivors on Earth prepare themselves for a rematch against the almighty villain. The trailer offers some key details about the upcoming film, but blink and you'll miss it. Survivors who we had not seen in the first trailer, including War Machine, Rocket, and Nebula, can be spotted. We also see Black Widow training in a shooting range, and Tony Stark working with Nebula on what seems to be the reconstruction of the Iron Man suit, using the remains of the ship on which Robert Downey Jr's character was stranded. As is only to be expected, the Internet is combing through every shot of the trailer in order to find answers and construct theories. 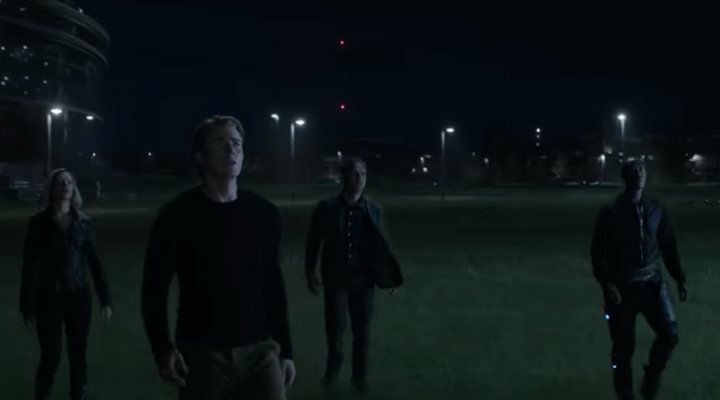 One such example is in this shot of Scarlett Johansson, Chris Evans, Mark Ruffalo, and Don Cheadle gazing up to the sky; there is an uncomfortable gap in the image, leading fans to believe that someone has been erased from the clip (which is something of a habit in Marvel trailers). Most people are betting on Captain Marvel being the missing figure, but of course the other question remains: what are they all looking at? Thanos? Iron Man returning from space? So many questions from only a moment of footage! All answers will be revealed when 'Avengers: Endgame', once again directed by the Russo brothers, comes cinemas on 26th April.